Apps are often built around targeted workflows that deliver streamlined user experiences. They’re designed to guide users through specific tasks, to show just the data that is required for that task, and to allow ease of communication of your message. This chapter shows where apps come from and how you can start to create your own. 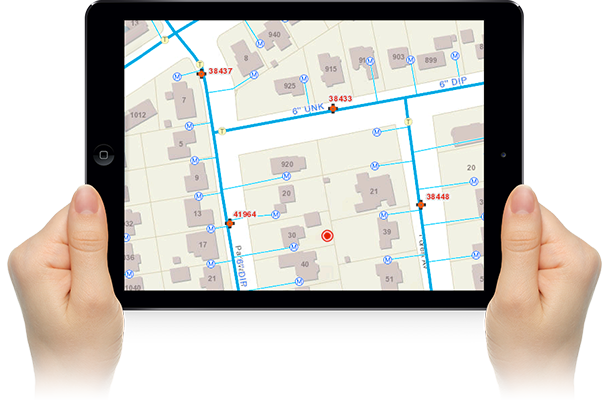 It explores some of the innovative ways that apps are being used to do real work with ArcGIS. You’ll discover ArcGIS apps for the work you do, no matter what the task or the device. Need to collect data in the field? There’s an app. Need to share your data with the public? There’s an app for that, too. Whether you’re managing a mobile workforce, creating a geolocation startup, or looking for innovative ways to share your information in a useful and meaningful way, apps are your way to do that. Now we’ll share ideas about almost a dozen different things that can be done with apps. As you read through, think about what it is that you need to do that could fit into one of these patterns. You can author a story map fairly easily by choosing from the many storytelling narrative styles offered in ArcGIS to bring your data to life. 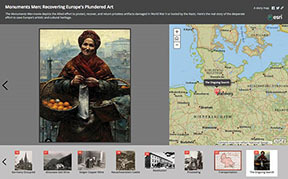 Story map apps combine maps with rich narratives and multimedia content that connect with an audience and keep them engaged. Here’s the real story of the desperate effort to save Europe’s artistic and cultural heritage. Map-centric apps offer an exciting and engaging way to publish your geographic information. When you can interact with a live map, send queries back to the GIS of the world, have the app follow you and alert you when you get certain places, all of a sudden you’ve got something very powerful and engaging because the experience is personal and familiar to you. 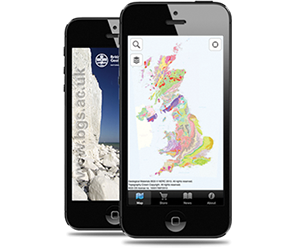 iGeology is a free smartphone app that lets you take more than 500 geological maps of Britain wherever you go to discover the landscape beneath your feet. 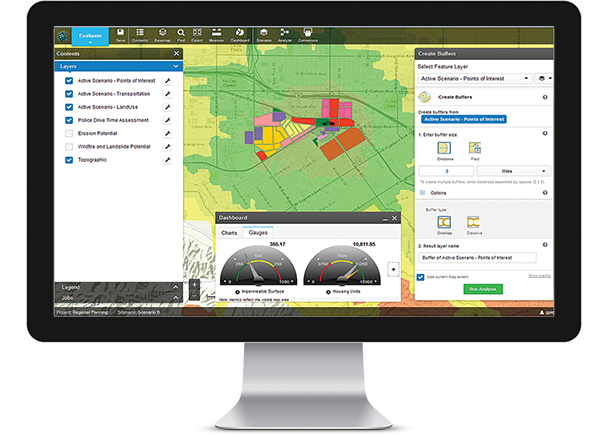 Apps provide the interface for the efficient collection of spatial data. You can work offline in the field with a native data collection app or employ crowdsourcing or VGI (volunteered geographic information) using a web app. 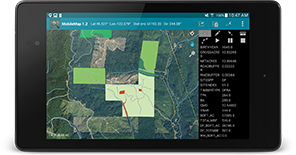 MobileMap from forest industry leader Mason, Bruce & Girard provides GIS functionality to users in the field, so they can collect data and perform complex visualization and discovery. The dramatic rise of high-powered, smart mobile devices means that almost everyone has a highly capable sensor in their pocket. This opens mobile data collection to almost every organization or person in the developed world. Big strides in cellular and mobile infrastructure have allowed GIS apps to be deployed in even the poorest regions internationally. The ubiquitous presence of handheld devices is being leveraged as a data collection tool very successfully throughout the world. Geographic insight is often the best way to answer pressing questions. Overlaying multiple layers on a map and analyzing them with advanced spatial models can highlight relationships that are not otherwise apparent. Knowledge workers using ArcGIS have the power to build models to answer almost any question, from where to locate a new facility to finding areas most at risk. With the GeoPlanner app, a city architect/analyst combines factors such as slope, aspect, population, and distance to water to understand the implications of many different development scenarios. Building open data portals provides public access to your authoritative data. Branded web apps allow you to share your data in ways that are easy to search and explore. Open Data lets you be part of a worldwide community of geodata content curators. To learn more, visit ArcGIS Open Data online. 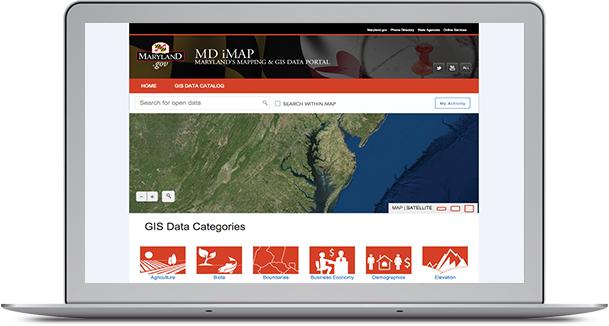 The widely adopted app, ArcGIS Open Data, provides an experience that enables GIS organizations to readily share their data with their community. Location may be front and center; meanwhile intelligent analysis runs invisibly in the background. Without distracting users from what they are trying to do, these background services allow alerts to be fired off when you need them. For example, when the device (and of course the user holding it) enters a certain area where hazardous materials are located, a “geo-fence” can warn them. 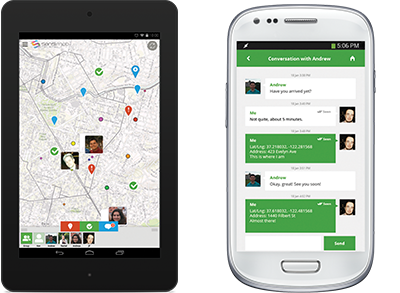 The Sensimob Field Team Messenger app (a native app for Android devices) combines GPS tracking functions with team-based social features allowing team members to keep track of each other’s whereabouts in real time. Knowing where workers are and keeping them safe and informed may be the difference between profit and loss—or even life and death. Device location sensors can be plugged into apps to record critical data to your operations. Spatial data also can be gleaned from other data sources, such as Twitter feeds, to help show patterns. This Live train app tracks the location of trains in Helsinki, Finland. Identifying your location and generating routes and directions help to keep your users moving in the right direction (even onto private roads or inside buildings). With the rich geocoding and routing services provided by Esri or through your own organization’s locators and networks, everyone can get around quickly and efficiently. FltPlan Go is an Electronic Flight Bag (EFB) for pilots. It offers a variety of tools and features including moving maps, geo-referenced approach plates, airport information, airport diagrams, up-to-date fuel prices, in-flight weather, and more. 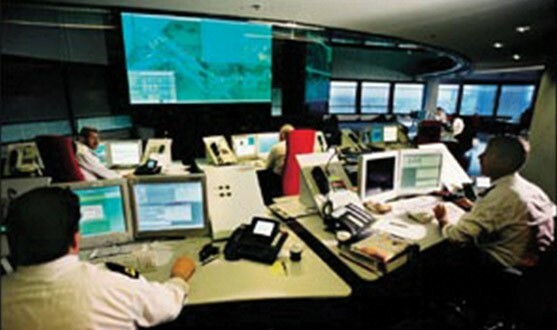 To control and plan operations you need to know where things are located and what their current conditions are. Pairing infographic displays with spatial location can be the most effective way to visualize an operation and communicate a management plan. Whether you are in the office or on the go, native and web apps help you make decisions. Sometimes apps fill the entire wall of a room. Operations centers run ArcGIS dashboards on big displays. 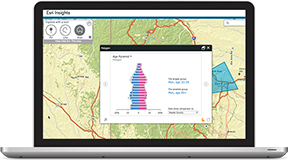 Esri Insights is a powerful web app that allows users to visualize demographic information about almost any area in the world. Gain deeper insight into the facts and dominant characteristics of your neighborhood or about your current location. 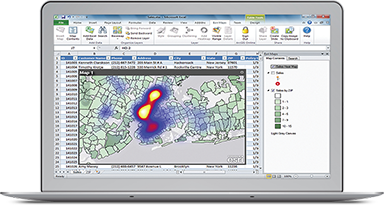 Esri Maps for Office helps you integrate information from Microsoft Office products like Excel and PowerPoint with your web maps. See your Excel spreadsheet data mapped within the Excel environment and updated automatically as you work on your spreadsheet.